This is a superb example of an Italian Baroque silver reliquary pendant, dating to the late 16th - 17th century. The case is empty, though would once have held a relic or devotional image. The silver frame is formed as a locket, with the front panel opening on a hinge to reveal a glazed compartment. 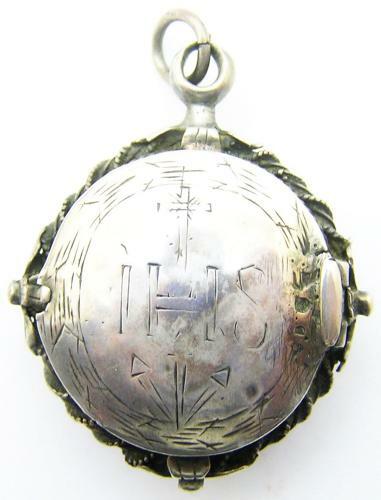 The front locket bears an engraved IHS Christogram, with the back a MARIA monogram. It is superbly decorated in a fine Italian style, likely purchased on a pilgrimage to Rome. DATE: c. 1580 - 1680 A.D.